Sure, gasoline engines aren’t efficient, but all that waste heat sure is nice in the winter. Since this car no longer has the original engine, it doesn’t have the original heat either. The blower motor is still there and works fine for defogging the windshield. For defrosting the windshield, I had a small 12V electric defroster that plugs into the cigarette lighter plug. These are commonly sold for gas cars to defrost their windshield faster. The mass of the oil in the radiator stays hot for about 10 minutes or so after I leave. Most of my trips aren’t any longer than that anyways. 2) The entire interior of the car is already warm – seats, steering wheel, everything! The only down side is that if I am parked all day somewhere that I can’t plug in, I don’t have that same heat for the ride home. On the other hand, most of my trips are pretty short, so it’s not the end of the world. Later, I built myself a heated coat. The idea is that I can stay warm in the winter working in my detached and unheated garage or while driving a vehicle. The HEATED COAT works great, and I even set it up to run from a small lithium tool battery! I also picked up a heated steering wheel cover. They are $20 brand-new at the store, and I found a second one later for only $5 brand-new at the thrift store! It plugs into the 12V cigarette-lighter plug and is cozy and warm. 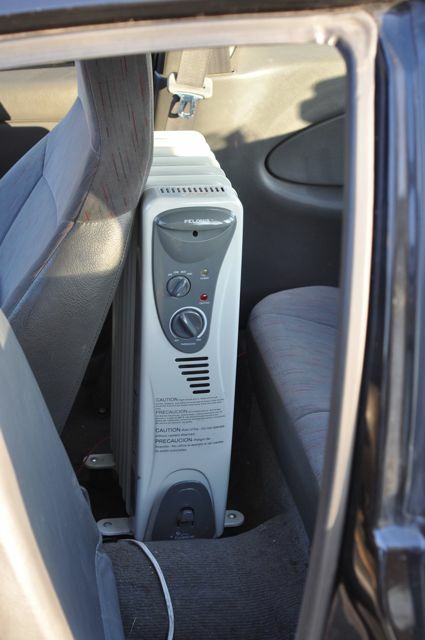 For a high-end DIY electric car conversion, a person can install an electric heater and pump. That will heat and circulate engine coolant to the car’s original heater core. This style of electric heater will run off main battery pack voltage. They can be purchased from electric vehicle parts vendors. Although it might seem counter-intuitive, a fuel-burning heater can be installed. Just like the old air-cooled Volkswagens, you can add an aftermarket heater which burns diesel, gasoline, kerosene, or ethanol. When we bought a Mitsubishi iMiEV in 2015, we found that the heater didn’t work great, and added a fuel burner to improve the heating system. Modern commercially-built electric cars have full heating and air-conditioning systems. Some use resistive heat, while others use heat pumps. Heated seats and steering wheels are common as well. One nice thing is that the electric heat comes on instantly, whereas on a gas car, you have to wait until the engine warms up. Nearly all EVs also have “pre-conditioning” systems. You set a timer or use a key fob or app to have your car automatically heat or cool. When you are ready to drive your car is already nice and warm in the winter and cool in the summer! If you live in a cold climate, ANY car can benefit from a 12V electric heated blanket! Seriously! They are affordable, practical, and versatile. Get one for your car! Good idea! Only trouble is, there are always going to be those moments where the weather surprises you and you have to wrestle with an icy windshield, then be pretty uncomfortable for even a short ride home. take a look at Espar heaters. They are a mobile water heater. They require a paltry amount of diesel to operate but sure work well. For $600 you can get the kit and connect it to the existing core. They usually come with a 7 day timer. gas versions are available as well. Most are capable of 7000 btu and up. It could be used to heat the batteries as well. I’m not a salesman. I engineered an Espar heater heater installation for a custom diesel truck recently. They are available from your local cummins dealer. When I later got a commercially-built electric car, it unfortunately did not have a particularly good heater. So, I added a Espar/Webasto style cabin heater designed for semi trucks.